Leptospirosis is a bacterial disease of dogs and other mammals that primarily affects the liver or kidneys. 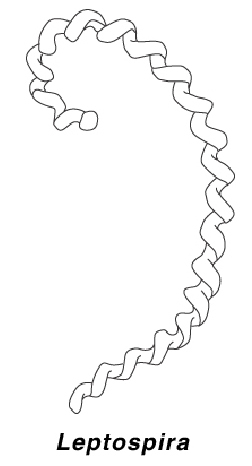 Leptospires are known as "aquatic spirochetes": the organism thrives in water and they have a helical or spiral shape with a characteristic hook on one or both ends. There are many species and serovars of Leptospira, some of which cause disease in dogs. In the past, the usual serovars that affected dogs were Leptospira canicola and Leptospira icterohemorrhagiae. In recent years, other species have become important in some areas. These include L. pomona,L. grippotyphosa, L. australis, and L. bratislava. The most common causes of Leptospirosis in dogs in the United States are L. grippotyphosa and L. pomona. There are other serovars that may infect dogs without apparently causing any signs or disease. There is no evidence that Leptospirosis causes clinical disease in cats. Infections of dogs with L. icterohemorrhagiae and L. canicola are uncommon in areas where widespread vaccination of dogs is routine. Outbreaks of the disease are still seen from time to time. As mentioned above, these may now involve newer serovars of Leptospira. New vaccines have been recently developed to protect dogs against the four most prevalent serovars. Leptospira bacteria are carried mainly by rats and other rodents, but can also be carried by almost any mammalian species, including people. Infected or recovered "carrier" dogs may act as a source of the infection. "Ingestion of infected urine or rodent-contaminated garbage is the most important means of transmission..."
Ingestion of infected urine or rodent-contaminated garbage is the most important means of transmission, but some forms of the bacteria can penetrate damaged or thin skin. For instance, when dogs swim in contaminated water, they may become infected through their skin. The incubation period (from infection to onset of clinical signs) is usually four to twelve days. Many Leptospira infections go undetected, but other cases can be life-threatening. Certain strains (serovars) of Leptospira are more likely to be associated with disease than other strains, and theicterohemorrhagiae serovar is perhaps the most dangerous. The icteric or jaundice form begins much like the hemorrhagic form and many of the clinical signs are the same. An additional clinical sign is the presence of a yellow color (jaundice or icterus) in the mouth and whites of the eyes. In severe cases, the skin will turn yellow. Because the clinical signs are variable and easily confused with other diseases, definitive diagnosis can be difficult. There are no readily available rapid and definitive laboratory tests. Taking blood samples during infection and again in the recovery period and showing an increase in antibodies toLeptospira in the blood serum (at least a four-fold increase in antibody titer) is supportive of the diagnosis. "Single test finding of Leptospira antibody...may not mean that the dog has Leptospirosis..."
A single test finding of Leptospira antibody, even if the blood level (titer) is high, may not mean that the dog has Leptospirosis because infection with less harmful serovars can still result in high antibody. Antibiotics such as penicillin, ampicillin and amoxicillin, are reasonably effective if begun early. Most affected dogs require intensive care in the veterinary hospital. An extended course of antibiotics, typically doxycycline, may be prescribed in the recovery period to ensure that all the Leptospira organisms are cleared and the dog does not become a chronic carrier. The vaccine for leptospirosis is not always part of the routine vaccination program for all dogs. Your veterinarian will consider the risks and options for your pet. Re-vaccinating every 6-9 months is often needed to maintain best immunity. The four-serovar vaccine is currently the only vaccine recommended by experts. Of the components of a dog's vaccination program, the portion for leptospirosis has been reported to be one of the more likely to cause a reaction. This usually takes the form of lethargy for a few days and possibly loss of appetite. In some dogs (Miniature Dachshunds and West Highland White Terriers seem to have slightly increased risk) a more general shock-like reaction may occur shortly after vaccination. Other dogs may develop a skin rash (urticaria), apparent on hairless areas. These reactions can be controlled medically, so if you are concerned call your veterinarian immediately. Modern vaccine production methods, such as the use of "sub-unit" or genetically manufactured vaccines may reduce the incidence of side effects. "Leptospirosis can be transmitted to people..."
NOTE: Leptospirosis can be transmitted to people, so owners of dogs that may have the disease should avoid contact between the owner's bare skin and their dog's urine, and wear rubber gloves when cleaning up any areas the dog may have soiled. Any areas where the dog has urinated should be disinfected. The organism is readily killed by household disinfectants or a dilute bleach solution.